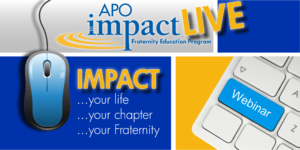 The APO LEADS program is dependent on dedicated volunteer presenters. If you have a passion for public speaking and leadership development this is the perfect volunteer role for you! We are always looking to add more presenters to the APO LEADS program in order to provide members with access to more APO LEADS courses. If you are interested in becoming an APO LEADS presenter and would like to receive updates when training is scheduled please fill out the following form here. It is important that APO LEADS presenters know and understand the ins and outs of the course that they are presenting. Therefore the Leadership Development Committee has developed a three step process for alumni members to become certified presenters. Further information on these steps and the requirements to become a certified presenter is listed below. Basic Skills (also known as Certified Presenter Training) is a certification course available to all members. This course emphasizes the importance of presentation and facilitation skills. Once a member demonstrates proficiency in both presentation and facilitation skills they are a certified presenter. As a certified presenter the individual may now complete training for a specific APO LEADS course. To fulfill the course an individual must complete both the webinar and the practical course. b.) Practical Course- are scheduled on a need basis. To signup for an available course please fill out the form found here. *Exemption option available: An individual may request an exemption form this step based on their professional or personal experience. Email the coordinator at [email protected] with evidence of your experience and skills to be considered for an exemption. Content Training is only available to alumni members. With the exception of Serve; in order to complete Content Training individuals must first complete the corresponding APO LEADS course. To locate a scheduled course view the APO LEADS Calendar. b.) Practical Course- The practical portion of the training is fast-to-face evaluation of an individuals ability to present course material. You must complete the webinar course prior to attending the practical course. To register for a practical course fill out the form here. Once an individual has completed steps 1 and 2 for a specific APO LEADS course they are now a certified presenter for that course. Presenters began as apprentices and with experience and practice they will move to the levels of staff, director and finally trainer. In ordered to be promoted to staff and director levels an individual must present alongside current directors to gain experience and practice. To find out about courses that are in need of presenters in your area email the coordinator at [email protected]. Pending courses are also sent to the course presenters Yahoo Group. If you are not a member of the Yahoo Group email staff at [email protected] to be added. TRAIN TO BECOME A COURSE OBSERVER!